Fortress Systems Pty. Ltd. is a designer and manufacturer of custom-made power resistors and had been acquired by the Post-Glover group when they first began working with TXM. Following the Post-Glover acquisition in 2009, half of the business was relocated to a new site. The resistor business found itself occupying a factory area that was much larger than it needed. The business had strong resources in finance and engineering, but the small production team was under-resourced and lacked the skills to independently achieve significant operational improvement. Plant layout was poor and lacked a clear production flow. The excessive space was quickly being filled in a disorganised manner. The business suffered from project driven peaks and troughs, and these were traditionally being covered by casual labour and high levels of overtime. This was at a high cost to the business. There was no effective measurement of productivity. TXM worked with the Fortress team and used value stream mapping to review the existing Fortress Systems processes. The initial mapping covered the main product stream of Enclosure manufacture; the second covered the Sales and Engineering processes to get products into manufacturing. A future state vision for the key value stream and the overall Fortress operation was then developed, along with an action plan to address the key issues identified in the review. Fortress Systems Finance Director Ross Phillips says TXM Lean Consultant Michelle Brown guided them through the entire process step by step. “As we went through the process we learnt new skills and were educated in new lean practices that we’ve been able to continue to implement in the business,” says Ross. The objective of the Production future state map was to reduce lead time to an average of three days for the Enclosure assembly. This reduced the need for short term production changes and having incomplete enclosures sitting around in various stages of production. 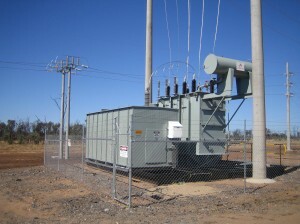 Leveling the supply cell for grid production reduced the work in progress on the line and increased productivity by reducing waiting times. A factory layout was developed from the Future State Map and the factory was rearranged to create defined areas for Enclosure assembly, testing, packing and supply cells – something that hadn’t been done before. 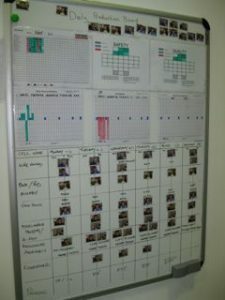 Visual management was developed to display the Production status, allowing the factory manager to schedule and highlight what supply cell parts and purchased parts were needed ahead of time. This allowed the lead-times to be reduced by only starting on an assembly when all of the components are available. Ross Phillips says the introduction of daily eight minute meetings between the teams has been instrumental in ensuring work flows smoothly through the factory. A problem solving system across Production, Sale and Engineering has been developed and the business has been able to reduce stock levels by the introduction of the Kanban inventory management system. Ross Phillips at Fortress Systems says the improvements to the company’s entire operation have been incredible. He says they have managed to reduce their longest lead in times from 16-18 weeks down to 10-12 weeks simply by looking at the process set-up between sales and engineering. “I think the key to the success of the work TXM has done is that we got the entire team on board and behind the process from the factory floor right through to the office staff,” says Ross.